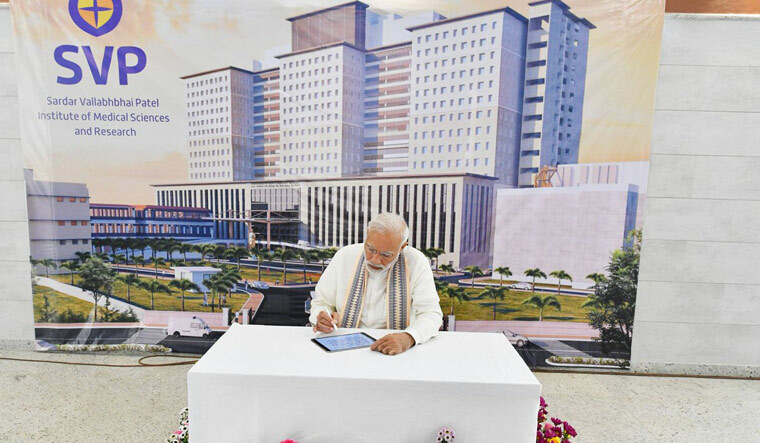 A day before the 9th edition of the Vibrant Gujarat Global Summit kicks off, Prime Minister Narendra Modi on Thursday gifted a Rs 750 crore, 1,600 bed ultra modern hospital to Ahmedabad. The 18-floor hospital—now considered the tallest building of Ahmedabad—also has a helipad to facilitate air ambulance service. An initiative of the Ahmedabad Municipal Corporation (AMC), the Sardar Vallabhbhai Patel Institute of Medical Science and Research is the first of its kind institute in Gujarat with high-tech facilities where even the poor would get corporate hospital-like facilities at nominal rates. Modi is on a three-day visit to his home state. This is his first visit to Gujarat in 2019. He will inaugurate the Vibrant Gujarat Global Summit at the Mahatma Mandir in Gandhinagar on Friday. With 2019 Lok Sabha elections at the back of his mind, Modi did not lose the opportunity to make a political statement and underline the initiatives undertaken by the BJP government in Gujarat and the BJP-led NDA government at the Centre. The opposition Congress in the AMC protested against opening of the hospital and also against the alleged move to privatise the Vadilal Sarabhai Hospital. The AMC had on Wednesday specified that even as the new hospital was to be inaugurated, there were no plans of privatising the V.S. Hospital. Modi said that some people spoke “negative” when they discussed the project in 2011-12. The prime minister said whosoever sees the hospital now will be satisfied, and added that the hospital will take the health services in the state to highest level. The prime minister said that the poor would get free treatment under the Ayushman Bharat Scheme in the new hospital. He went on to say that seven lakh poor were treated in 100 days of the launch of the scheme and every day 10,000 people are being treated across the country. Five thousand generic medicine stories were opened across the country and rates of stents and knee implants have been reduced, he said, adding that because of the reduced rate of knee implements, there was an annual saving of Rs 1500 crore. Modi also mentioned the 10 per cent reservation to economically poor in the general category, and said that till now it was not implemented due to lack of political will. He said that the new reservation scheme would lead to social equality. Modi also inaugurated the Global Trade Show, as part of the Vibrant Gujarat Global Summit, and Ahmedabad Shopping Festival. He also shopped at the Shopping Festival.